On June 8, 2017, the Global Alliance for Livestock Veterinary Medicines (GALVmed) convened a workshop in Kampala, Uganda, aimed at presenting the findings on the safety and protection of East Coast Fever-Infection Treatment Method (ECF-ITM) vaccine at farm level in the country. The findings were from an on-farm ECF-ITM study in Uganda supported by GALVmed in 2016-2017. The study involved 378 head of cattle, which showed 98 percent protection against ECF parasite field challenge, according to Professor Antony Musoke, a GALVmed consultant on the ECF vaccine. “Throughout the immunisation process we found that the vaccine was very safe, there were no adverse reactions at the site of inoculation; and the animals were in very good condition,” said Professor Musoke. The findings also indicated that the vaccine commonly known as ‘Muguga Cocktail’ is a cheaper alternative to treating ECF for cross-bred cows. The average cost of vaccinating cattle against ECF is US $10 compared to the cost of treatment which is averaging US $20. According to Dr. Anna Rose Ademun, the acting Commissioner for Animal Resources in Uganda, though the findings are promising, there is need for increased farmers’ awareness on the vaccine’s existence and protection. That’s because ECF is devastating the country’s growing dairy industry since the high yielding cattle milk breeds in the sector are more vulnerable to the disease than indigenous ones. “It’s important to inform farmers on the usefulness of the vaccine, especially the fact that it will save them on the weekly dipping or spraying expenses,” said Dr Ademun. She also cited the need for farmers to be informed that the ECF-ITM vaccine offers a lifetime protection to encourage them to vaccinate. However, it is important to note that dipping or spraying against ticks should not be stopped as there are other tick-borne diseases not prevented by vaccination. 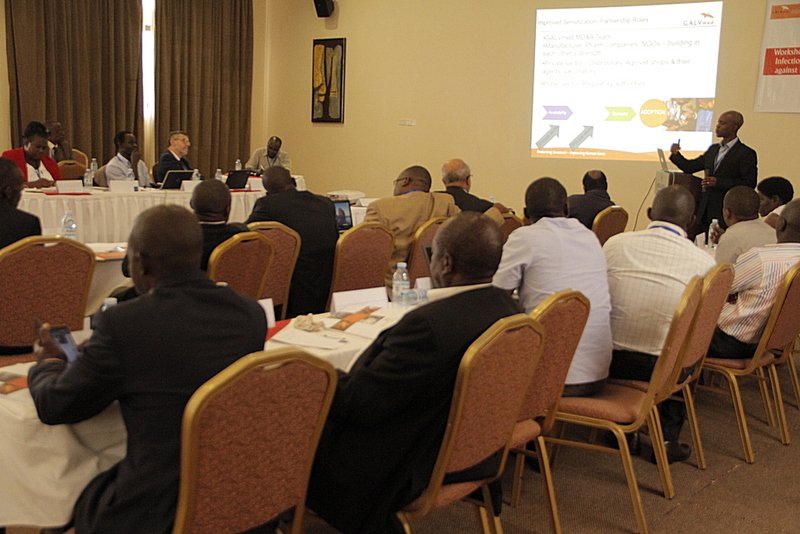 The nearly 50 workshop attendees consisting of researchers, vaccine distributors, farmers, and Uganda’s Ministry of Agriculture, Animal Industry and Fisheries (MAAIF), and drug regulatory authority officials also discussed the way forward for ECF-ITM vaccine delivery in the country. With the on-farm study proving successful, livestock stakeholders in Uganda are working to have the vaccine registered by the country’s National Drug Authority (NDA). The registration is subject to the vaccine producers, the Centre for Ticks and Tick-Borne Diseases (CTTBD) in Malawi complying with Good Manufacturing Practice (GMP) standards as stipulated by NDA’s veterinary drug regulation division. Since 2015, the NDA has performed inspections of the CTTBD facilities in Malawi – Africa’s only ticks and tick-borne diseases centre where the ECF-ITM vaccine is produced for the continent, and also of the distribution facilities in Uganda. These recurring inspections are aimed at ascertaining the safety, quality, and efficacy of the ECF-ITM vaccine. “Following the successful results of the re-inspection, we are hoping the product (vaccine) will be registered before the end of this year,” said Dr Noel Aineplan, NDA’s veterinary drug regulation division coordinator. Registration will clear the ECF-ITM vaccine for the Ugandan market, in a country with 13,623,000 heads of cattle, as per MAAIF’s 2014 data. To ensure continued supply of the vital vaccine, GALVmed has been working to increase the efficiency of vaccine production at CTTBD. Boosting CTTBD’s ECF-ITM vaccine’s production capacity by GALVmed will make the centre financially viable. “That is the only way sustainability of the vaccine is guaranteed which is very important for farmers who wish to buy this product (vaccine), to prevent deaths due to ECF,” said GALVmed Chief Scientific Officer Dr Jeremy Salt. Since 2013 GALVmed has also been supporting ERAM, a veterinary pharmaceuticals company and vaccine distributor to get the ECF-ITM vaccine to Ugandan farmers. ERAM and SCOPEVET were the two Ugandan ECF-ITM distributors that vaccinated the 378 cattle monitored in the just concluded on-farm study by the GALVmed consultants, Drs Fred Musisi and Robert Mutaka-Nsubuga. Through this support 100,000 animals from 20,000 households have been vaccinated against ECF from 2013 to 2017; and a total of 200 Ugandan ECF-ITM vaccinators trained both in Uganda and Kenya to administer the ECF-ITM vaccine.